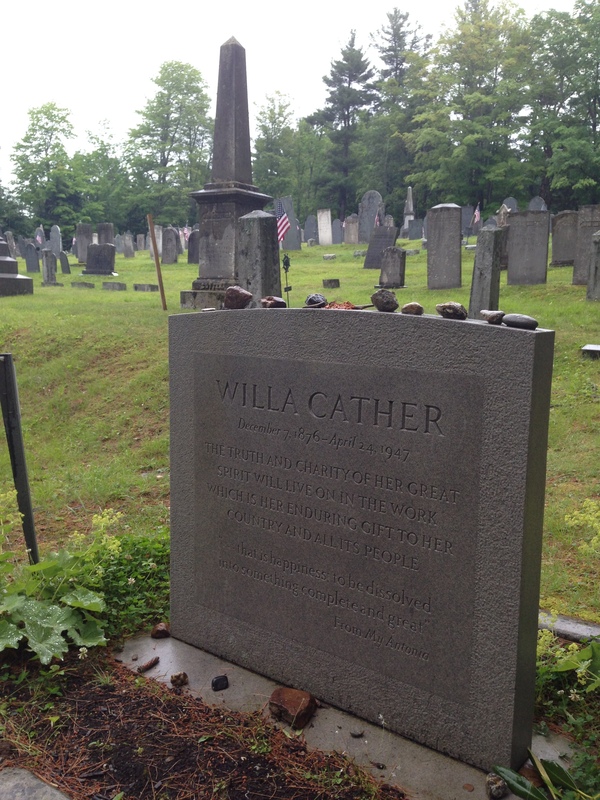 One day while reading a short bio of Willa Cather I stumbled upon the fact that she’s buried in Jaffrey, New Hampshire, only an hour and a half from where I live. As you can imagine, I was ecstatic. I was shocked when I learned she’s buried in NH because I knew she was born in Virginia and raised in Nebraska. Though she died in Manhattan, she asked to be buried in Jeffrey because apparently it was where she wrote a lot of her novels. She’s buried there with Edith Lewis, the woman she lived with for decades. 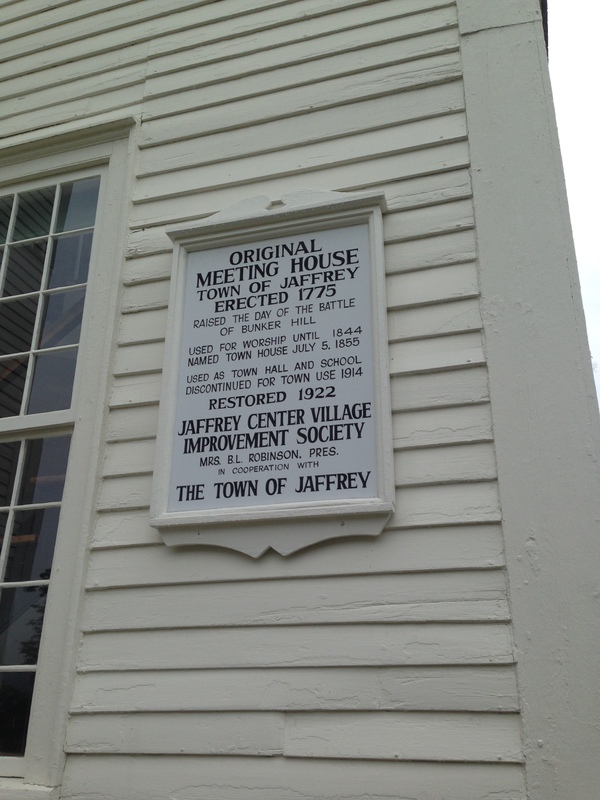 The sign on the Meeting House in Jaffrey, NH. 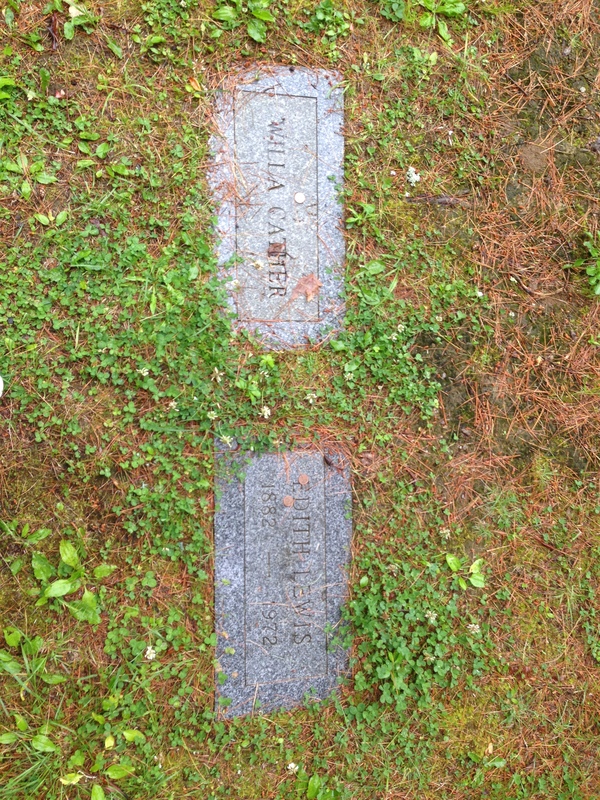 Recently my mom and I made the trek to Jaffrey to see the grave in person. She’s buried in the Old Burial Ground behind the Meeting House, which is a really beautiful old building in and of itself. When we pulled into the dirt parking lot on that rainy Friday morning we weren’t quite sure where we were headed, but fortunately we easily found her grave site because it’s in a corner near a stone wall (which we had to hop). The burial ground itself was actually kind of beautiful, even though that might sound weird. There were so many old, weathered headstones in all kinds of shapes and sizes. Part of me wanted to just stroll through it row by row and take it all in, but the rain encouraged us to be quick to avoid getting completely soaked. I was almost glad it was raining because it made the day feel cozy, peaceful, and even sort of eerie. When we finally arrived at her headstone I couldn’t help but gasp. There she was. There’s a great quote from My Ántonia on Cather’s headstone, which made me so happy because I love that book immensely. There were also a bunch of rocks and pennies on her grave, most likely from others who admire her work as well. I was definitely the happiest person in this burial graveyard (and the only person besides my mom). 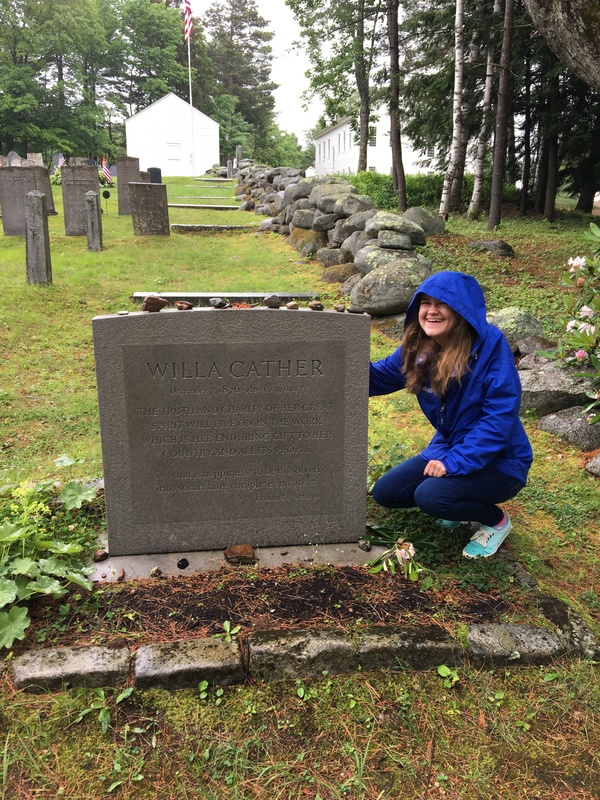 Standing in front of Willa Cather’s grave was surreal. Too often it can feel as though authors are these untouchable, legendary figures who live on forever through the pages of their work. While visiting a grave like this it’s impossible to not feel a wave of realization wash over you: this woman was human, with hopes and dreams and flaws and desires just like the rest of us. Though I sometimes like to believe that the books I love hold a sort of elevated notion of truth and meaning that emanates from their spines, it’s important to remember that these texts were written by people just like us. Writers exist beyond their work, which is easy to forget when you’re engrossed in their stories and captivated by their words. 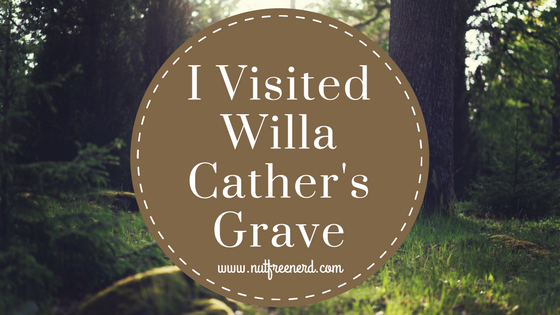 Visiting Cather’s grave made everything feel much more real, tangible, and within reach. Needless to say, I want to read everything that Willa Cather has ever written now, even more so than I did before. I’m so happy I had the opportunity to visit such an interesting piece of literary history— it’s definitely a place I would visit again in the future! Have you ever visited the grave sites of your favorite authors? (Also, how weird is that question out of context?!) Do you have a favorite novel or short story by Willa Cather? Let me know in the comments section below! That’s so cool that you visited Oscar Wilde’s grave!! Where is his located? I visited Hemingway’s grave up in Idaho once. It’s not a habit of mine to lounge amongst the dead, but Hemingway’s writing–or at least his short stories–have always enrichened my life. For me, he’s up there with J. S. Bach. “Big Two-Hearted River” and “A Clean, Well-Lighted Place” are transcendent works of art. I love Willa Cather’s writing as well, and need to re-read it all, as it’s been many years. You were lucky to get to visit her. Nothing “weird” about it. Visiting Hemingway’s grave is definitely on my bucket list as well. Visiting these sites is such a surreal experience. I haven’t read anything by her yet!! I have visited the grave of Thomas Hardy though (or more specifically where his heart is buried). Whoa– you visited Thomas Hardy’s HEART?!?! Where is that??? Ah, Hardy! One of my favorites–I especially favor his “Jude the Obscure.” A moving book, funny in parts despite being overall rather grim. That’s so cool!! I had no idea she was buried there either, and I’m originally from New Hampshire! I’m pretty sure I’ve read some short stories by Willa Cather (my degree in Literature makes me think she probably had some stories in one of my literature anthologies), but I can’t immediately bring to mind any of them. Anyway, this is an awesome post, and I’m sure it was quite an awe-inspiring trip for you. That’s pretty cool. I don’t think I’ve been to any author graves yet, but perhaps someday I’ll be able to visit a few. You definitely should visit a grave if you get the chance– it’s such a surreal experience!! I’ve been to several presidential tombs and those are always interesting. Her books aren’t for everyone, but I think they’re so beautiful! ❤ I hope you enjoy them if you decide to read them! How exciting for you. I absolutely want to go there some time, but it takes slightly longer to get there from Colorado. If you ever make it to Nebraska, please visit Red Cloud. I am taking the liberty of attaching a link to one of my blog posts about a visit there. Thank you. Cemeteries are generally beautiful because they’re so parklike. Of course, I’m a psychopath so don’t trust my word on it. haha no I totally agree! There’s a strange beauty about cemeteries. Visiting the graves of Ray Bradbury and Tolkien would be amazing!